Need a new smartphone? 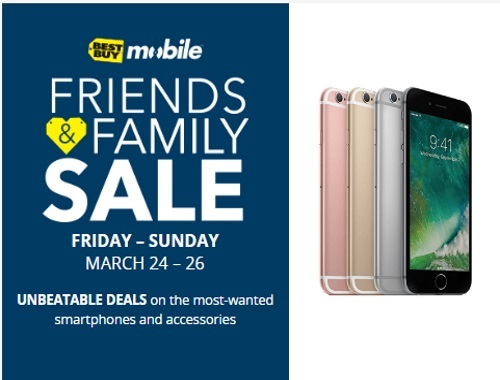 Best Buy has a Mobile Friends & Family Sale on now! Unbeatable deals on the most wanted smartphone and accessories. Their featured deal is the iPhne 6 125GB for $0 (Save $400) after $30 trade-in on select 2 year Premium plans (plus Free $50 gift card). $29.99 save $370 without trade-in. 32GB also availablle at $0 plus a $100 gift card. Offer is valid March 24-26, 2017.